Lights, Volumetric Capture, Action! 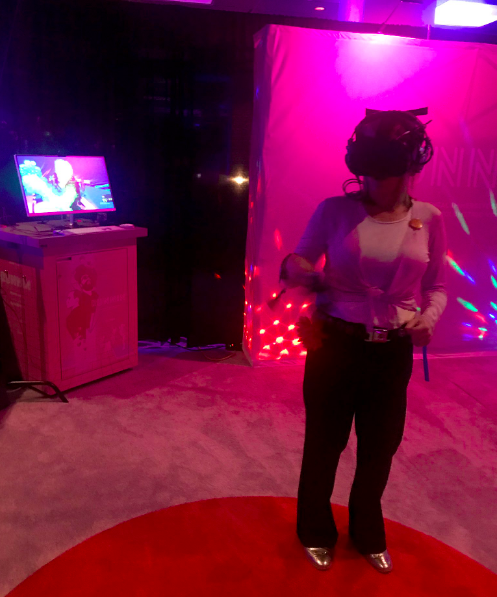 Kiira Benzing of Double Eye Studios transported into the social VR platform, Facebook Spaces, to talk about the interactive dance experience that recently won a VR Cinema Jury Award at SXSW and has taken a dance party to a whole new level. Starting my day with good vibes at SXSW 2019. Runnin’, generated by Reggie Watts, produced by Intel Studios, and directed and written by Women in VR multi-dimensional director Kiira Benzing, is a first of its kind, virtual reality (VR) energizing dance party. It teleports you to a dreamworld dance floor of tomorrow, a vibrant scene somewhere in another universe. And it all begins where music began for me and most of my generation — in a record store. That’s exactly how I felt when immersed in my pink circular carpet area in the VR Cinema booth exhibit Runnin’. The musical journey brought the virtual dance floor to life through my movements and the scene splashed with colors ignited a euphoric feeling of good vibes, party fever, and old-school nostalgia. I recently attended SXSW thanks to another Women in AR VR rock star and Managing Partner of We Are Phase2, Samantha G. Wolfe, who generously provided me an admission ticket that would unlock a wondrous week of what’s what and who’s who in the tech, music, and entertainment world. Samantha introduced me to Kiira Benzing and told me to check out “Runnin,’ which was created by this friend who had ironically once given her a ticket to SXSW. Note to all: Pay it forward, Girl power style! In my first meeting with Benzing and after watching Runnin’, I could immediately respect her talent and ambition. She is a visionary who pushes the boundaries in new technology with creativity, work ethic, and inspirational storytelling. In 2017 while filming Tribeca Film Festival Official Selection Hilda, Benzing saw an opportunity that lied far beyond traditional directorial methods. Runnin’ was derived through Benzing’s exploration and adaptation explored into Virtual Reality (VR). She created a musical dreamworld featuring a dance floor, a record store, infamous music makers Reggie Watts and John Tejada, and new art forms such as voxels. So dress up to the nines, slap on your best virtual dancing shoes, and start Runnin’ to the virtual beat. Who is Kiira (with a double “i”) Benzing? Kiira Benzing is a multi-dimensional director who has crossed boundaries (fortunately not as far out there as “The OA”, Netflix (US) » TV Series). She’s worked in many formats of film including 2D, 360, volumetric capture, and 3D animation breaking barriers and pushing limits to create immersive, interactive experiences. Benzing has been involved with Google’s Jump Start program, a JustFilms Fellow in partnership with the Made in NY Media Center by IFP, and has been selected twice for the Oculus Launch Pad program. She’s won multiple accolades/ awards and has exhibited her films in Tribeca, Sundance, SXSW, and more esteemed festivals and showcases. I was honored to have recently joined her in social VR, while working on a new film, Alive in Plastic Land. How is directing in Virtual Reality (VR) different than directing non-VR footage? I like to bring in game mechanics, not that Runnin’ is a gamified experience, but we’re working with things that would enable the audience, as a player, to interact, play and make choices within the story. We give them agency. Ready, Set, Runnin’ — The Experience. Runnin’ is different from other dance, music, and other volumetric experiences. First and foremost, the player’s empowerment is to engage with the environment and the music. The piece is not linear, there is a non-linear structure within the dance scene — giving the player ability to explore the dance cube from all perspectives. Technology: Runnin’ uses the volumetric capture method, where footage of the dancers are recorded from different angles and viewpoints from Intel’s Volumetric Stage. Photogrammetry follows the volumetric capture when software analyzes, compresses, and then recreates the different angles and viewpoints of a 3D human. Voxels make up the unique technology produced by Intel Studios’ volumetric capture system. I was excited to work with voxels because they are 3-dimensional and give the player inside the experience the chance to interact with the dancers. Physics intertwine with the voxels, so they react with motion as you move your hand controllers or in this case, virtual glow sticks. The Experience: The dance floor opens and Reggie Watts appears in hologram form in an amazing, colorful purple dome. Reggie comes out of the ground and then he lifts off and as he appears, the dome flies away. Reggie continues to dance and then pink boxes (aka voxels) highlight featured dancers/Choreographers, Ani Taj, Amy O’Neal and a few others. They join the fun and dance near the player while Reggie is grooving and John Tejada is on the DJ stage with him. Tejada flies out to a far away DJ stand. Next, platforms fly out to the corners and the entire space opens up as the stage expands. The platforms move and shift and start to reveal extended space around the players, so what you begin to witness as a dance floor, what you perceive as your reality, continues to change. Magical objects begin to appear resembling something out of the eighties from TV shows like “Saved by the Bell.” The whimsical floating objects surround us and enhance the dance party scene welcoming the user to step on the floor and cut loose. Immersive: You can touch the dancers and a burst of light, color, and energy runs through you. The dancers have been volumetrically captured and it’s almost like they’re made of these pixels, known as voxels, which in effect are three-dimensional pixels. Kiira discusses some incredible shader work with an artist, Jigar Patel, who helped transform the dancers changing their positions, colors, and shapes. The dancers keep morphing and transforming as the player gets near them and dances through them, interacting and moving with the flow of dancers and their associated voxels. Benzing Explains the Difference Between Voxels and Pixels. Fact: Nothing you to do in Runnin’ is wrong. Goal: Everything is playful, immersive and interactive — Dance like no one is watching. Was Sundance the first time you showed Runnin’? Yes, Sundance was our World Premiere and we couldn’t have imagined a better venue and audience. What kind of feedback did you get at Sundance? The best kind of feedback. We finally had a chance to put this world in someone else’s mind. One could explore this tiny universe down a nostalgic memory trip through a record store while incredible surreal dance scenes encourage the user could to let loose, explore, and feel the rhythm of the high-energy music. Kiira explains, it was a total dream to be able to share with people at such a prestigious festival. After her creation was well received at Sundance, it was extremely gratifying to be recognized with an award at SXSW. The Idea Behind VR Dance Project Runnin’? My original idea was to be transported into Reggie’s music through a portal and the player would be kind of like the White Rabbit in Alice in Wonderland where we’d be chasing after him through these different dance spaces. The project is a little bit more linear, but still interactive from the first scene’s record store and culminating in the final room where performers and the user co-mingle forming an all-out dance party. Just Dance. The Choreographer 411. I’ve worked with Ani Taj on some 360 video projects before, but I really wanted to work with her in a more interactive way in VR. Ani Taj is a choreographer, performer, teaching artist, music-head, and founder of The Dance Cartel and works spatially really well, so I wanted to see her work translate into VR. It was just an incredible collaboration. Interestingly enough, she is also a mutual colleague of Reggie and had been working with award-winning hybrid dancer, performer, choreographer and dance educator Amy O’Neal for many years. We gathered them together and fused their different styles to convey an incredible burst of high-energy dance, freestyle flow movement. The blend of both of their skill sets came together while they trained and mimicked those moves and styles to the dancers. When working with this technology, the footage is shot in bursts which Ani’s choreography and Amy’s work both fit really well. We did some rehearsals with the dancers and specifically practiced to create graphed loops for them. Then we made sure we saved some time for freestyle movement which could be more improvisational. Directing and Cast: In addition to Reggie Watts, 12 dancers were sharing the space together. When so immersed, it’s an astounding reminder to recognize what the space feels like and acknowledge it is a virtual landscape where a user experience looks and feels so real. It’s important as a director to always convey an energy and have a mindset that welcomes and engages the player that’s coming into the space. Once the player is inserted in this incredible 360 degree volumetric 3-dimensional world everywhere they look, they feel welcomed by the surrounding dancers and understand that they fit right in. Directing was painting the picture for them in bits and spurts about how the sequences were going to fit in a 3D universe. We do different scenes at different times so it’s crucial to put all the pieces together when moving into the development process with the engineers and post-production team. Branding: The Colors in the Experience. Live in Social VR Platform, Facebook Spaces, with Kiira Benzing. The tendency is to lean to dark colors but I wanted the experience to feel really warm, inviting, and bright, allowing the player to feel welcomed. Reggie agreed with this warmer color palette, so we reviewed a bunch of color palettes together until we landed on both of our favorite, a kind of magenta hot pink landscape (special thanks to our concept artist Robbie Tilton). 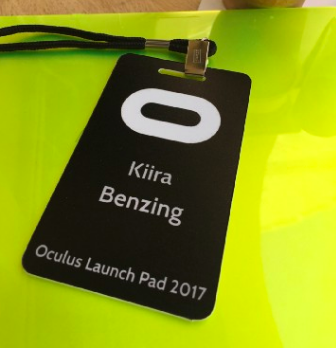 What did you learn at Oculus Launch Pad that Helped You in Writing/Directing Runnin’? of community. You get to meet other creators that are working in VR that are trying to innovate, think outside the box, take risks, and experience and develop new tools. Inevitably, all of this leads to a new medium, a place resulting in a new type of storytelling that we haven’t seen in literature, cinema, gaming, etc. To be an independent creator in the space or when growing your own studio, you’re meeting peers that are going through the same challenges and nuances and traveling through an untapped world of creativity and entertainment. VR is such a different incredible open space where you can play out your wildest dreams. This whole universe came to me in a dream. It started with aspects of mechanics that I wanted to play with and then had to connect the dots. After multiple scripts and honing in on the final theme, all the pieces came together into this dream-like reality. Are there Challenges Working as an Independent Filmmaker? When you’re creating in the space, you’re always working with a cooperative team. I think you can’t work in VR unless you’re working with other collaborators. There are so many skill sets that are necessary to build these kinds of worlds and to optimize the interactivity. It certainly takes much more than just one person tinkering in a toolbox. It takes a team and plenty of practice and exploration to create an environment when one feels comfortable to move around and dive deep into their own psyche and imagination. What we live for is to take those experiences and connect them to people. Put a headset on someone and watch them take off with amazement and a smile as they transverse along their virtual vessel. Runnin’ will be making the rounds of the festival circuit, so stay tuned. I’m working with a team in New York called Alive in Plastic Land. 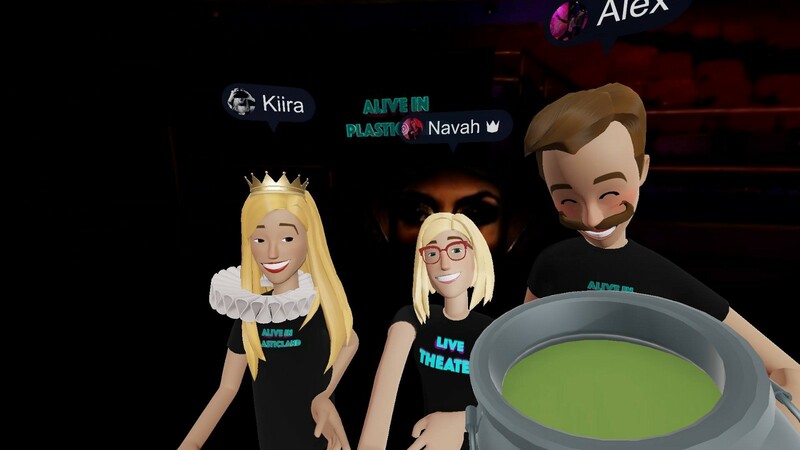 We are training a troupe of improv actors to perform their craft of comedy in social VR. 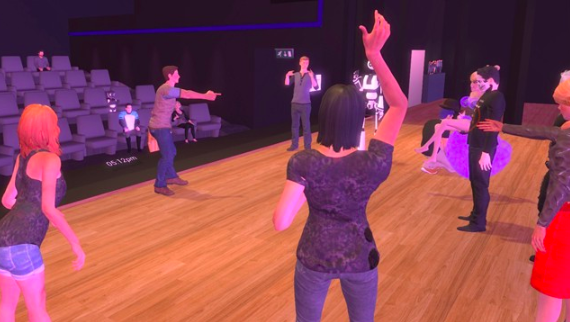 The idea is that an audience can attend virtually, through their computers at home but we can also merge that with a real-world setting and bring in a real-world live audience. We’re seeking and succeeding at finding ways to bridge those audiences. Even huge brands and entities like the NBA have created environments where consumers and fans can participate and be a spectator from the confines of their own home and headset. We put our actors into avatars and within our stories. 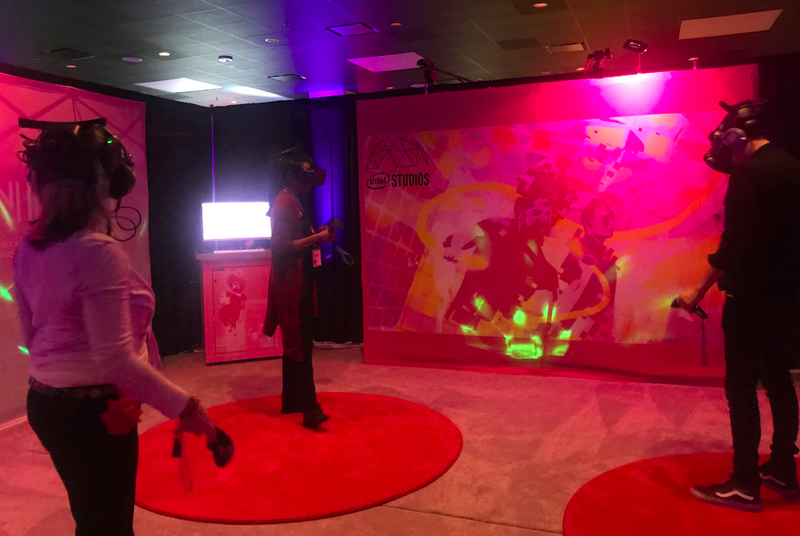 They have magical abilities in VR, the futuristic forum with the opportunity to play, perform, and experience just about anything. We can really defy the rules of physics that we can’t do in the real world so it gives us a whole new frontier of magical options and immersive capabilities. There is so much more to know about Kiira Benzing. The one thing I know: Runnin’ vibes are exactly what you feel when you’re immersed in her world — joy, excitement and an innovative, inspirational approach to this new world of technology, a space with groundbreaking advancements and endless possibilities. Do you want to learn more about Kiira Benzing? Follow her Medium Blog Kiira. 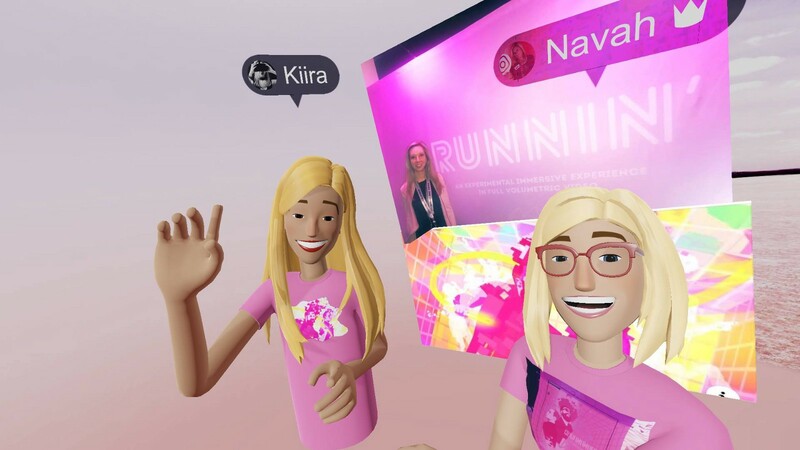 Want to learn more about how you can transport into Social VR and connect with people around the world? Join the conversation on Facebook.